Egyptian hieroglyphics have always been seen as a mysterious and exotic script that has captured the interest of society from the Roman occupation of Egypt, right down to the present day. Though they have always been a subject of interest, people’s understandings of this ancient script have been forever influenced by aspects that limited their understanding. This report looks into those influences passed down from generation to generation of scholars and within everyday society, from the days of the Roman tourists in Egypt, where Egyptian guides purposely gave the Romans misinformation, and the interpretation of hieroglyphs was mistaken by the Roman views. Through the renaissance and classical periods, scholars were still influenced by early writings and the society, right down to the eighteen hundreds, until Champollion decided to take a different view. But before this sudden change, he, like hundreds of others was unable to accept any other possibilities. These early influences included the effects of Hor-Apollo’s writings, Kircher and Young, plus many others. There are however some historians who don’t believe these writings were major influence. 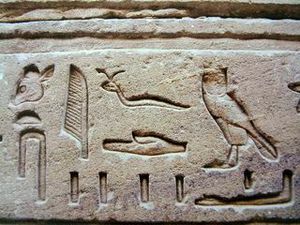 The scholarship associated with the translation of hieroglyphs have greatly influenced the general interpretation of their meanings even in the Roman times. Hilary Wilson demonstrates that the writings of early translators influenced the understanding of the script until the nineteenth century AD. Robinson evaluates that the understanding of the Romans was misguided by an Egyptian priest by the name of Hor-Apollo. Hor-Apollo wrote a book in Coptic which had a dramatic effect on the study of Hieroglyphs. Hor-Apollo’s work insisted that each sign had a single pictorial or symbolic meaning, this indicates that he completely misunderstood the writing system used by his ancestors. Unfortunately, because it was considered to have been written by someone informed, Hor-Apollo’s work was used as a guide for all future students of hieroglyphs. Though the translations of Hor-Apollo were meant to be correct and did not intentionally lead people into thinking incorrectly, there were other influences on the Roman understanding of hieroglyphs that were purposely trying to lead them astray. Montet asserts that in the Graeco-Roman period it gave the Egyptian community great satisfaction to mislead foreigners. They did this by concocting unintelligible documents, of which the foreigners could make nothing. Perrottet explains that because of this misinformation; it was misguidedly thought that hieroglyphs were only magical riddles, enchantments and spells. Perrottet however disagrees with Hor-Apollo being the original major source of the misinterpretation. He assesses that the Roman tourists were misled by spell books supposedly written ten thousand years earlier by Hermes Trismegistus. These writings however were nothing more than items to entice tourists. With the Roman’s great depth of superstition and with nobody to contradict the Egyptian guides’ explanations; they had no reason to doubt what they were being told. Hoijer is one of a group of historians who believe differently. Hoijer evaluates that the Romans were not influenced by the writings and misinterpretations of others, but by the fact that like the majority of historians and society, they viewed the land and its culture through the distorted prism of their own culture. Due to this, we can evaluate that as a result they misinterpreted almost everything. Parkinson agrees with the point relating to culture, but also attributes the misinterpretation to the before-mentioned point concerning historians in the ancient world fueling the beliefs of the Romans, mentioning that the Egyptians also contributed to this, by fueling the disinformation. The understanding of the Romans set groundwork for future scholars. Robinson outlines that with the renaissance, the revival of classical learning, came a revival of the Roman belief in Egyptian hieroglyphic wisdom. Due to this revival, renaissance writers continued to write and translate hieroglyphs to the standards set out by the Roman beliefs. This led to the first book, written in the sixteenth century by Pierius Valerianus, on hieroglyphs, being basically fictitious. This is because Valerianus took a narrow-minded view in his translations, taking his cue directly from Hor-Apollo’s incorrect translations and not attempting to look at them in any other way. Sacks assesses that because the translations of text were flawed and made no logical sense, classical scholars continued to believe long after the time of the Romans, that hieroglyphs were nothing more than riddles and enchantments. Scholars and philosophers continued to attempt to translate the hieroglyphs as they believed they would find ancient wisdom and long-forgotten truths, confirmation of biblical stories and some proof of the existence of figures such as Abraham, Joseph and Moses. This is another example of how the writing of history affected the understandings of hieroglyphs. In this case, the religious scholars were taking their experience and trying to link it to the translation of the hieroglyphs. This was mainly because of the Egyptian connection to the biblical stories; so scholars alleged that the Bible would be confirmed by the ancient script. In the late seventeenth century, the Coptic language was revived and would later be essential in the deciphering of the hieroglyphs. But scholars were still under the impression that the writing of Hor-Apollo and Valerianus held the key to translating the hieroglyphs. In the renaissance, scholars were interested in Egypt and were anxious to discover the meaning of the hieroglyphic writing. The Jesuit, Kircher, was the best known of these pioneers. Kircher outlined that Egyptian hieroglyphs only expressed ideas rather than sounds and ideas. Due to this misinterpretation, Champollion was still possessed by this idea in the nineteenth century. In the mid seventeenth century, Athanasius translated a cartouche for a priest and came out with a long rambling paragraph, however the cartouche really only read the name ‘Psamtik’ spelt phonetically. This mistake is an example of how the ideas and experiences of others have caused distortion. Robinson evaluates that it was only later that the enlightenment made by the revival of the Coptic language brought about questions of the classical views of hieroglyphs. Though the views did start to be questioned by the few, the original views were still held by the majority. It was the few who made progress towards the actual deciphering of hieroglyphs. This shows progress could only be made by those who took a more impartial view over their work. For instance, Barthélemy discovered that the cartouches contained the names of Egyptian Kings and Queens only by looking outside society’s understandings and beliefs drawn from Hor-Apollo’s writings. However it was Zoëga who finally commented that some hieroglyphs might be phonetic signs. This was only because, unlike other academics, Zoëga thought more on his own terms. The demotic language scripts on the Rosetta Stone, year 196 BC. Napoleon Bonaparte played a large role leading up to decipherment. When he traveled to Egypt he took with him a large number of scholars. These scholars studied and measured every site and every visible monument, finally publishing their findings in ‘La Description de l’Egypt’. However the influence of past work in the decipherment of hieroglyphs prevented them from deciphering the elements they studied. Scholars in the case of the Rosetta stone immediately concluded that the inscription was wholly non-phonetic, its symbols expressing ideas in the manner of Hor-Apollo. In the decipherment efforts in the early nineteenth century, it was noted that there was a difference between the hieroglyphic and the Egyptian Demotic writings found on the Rosetta stone. 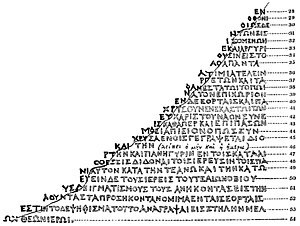 It was Thomas Young who first noted a striking resemblance between some demotic symbols and the corresponding hieroglyphs, he noted that ‘none of these characters could be reconciled, without inconceivable violence, to the forms of any imaginable alphabet’. Young put a step forward but came unstuck. The influence of the early work of Hor-Apollo and Young’s experience and teachings, made Young unable to accept anything but that all hieroglyphs (apart from foreign names) were non-phonetic. Even Jean-Francois Champollion, the final decipherer of the hieroglyphic script, at first continued to believe that the hieroglyphs were entirely non-phonetic. Champollion was not only influenced by Hor-Apollo and other past historians and translators, but also by the scholars of his own time. He was mostly influenced by Young’s work. Unlike Young, Champollion had an originality and rigour, which was based on a knowledge of Egypt and its languages far superior to his predecessors. This was a key component in translating hieroglyphs, as it allowed Champollion to look at a far bigger picture, yet he was still caught in the webs of disinformation from the past. Robinson outlines that the early efforts of Champollion in 1822 were based on the premise that only non-Egyptian names and words in both demotic and hieroglyphic were spelt alphabetically. Champollion did not expect that this decipherment would apply to the entire hieroglyphic system. Champollion, though for unknown reasons, later changed his mind about the phonetic issues with hieroglyphs, this was most likely due to yet another outside influence. A contemporary French scholar of the Chinese language suggested that there were phonetic elements even in the indigenous spellings of the Chinese script with its thousands of characters. This outside influence, though not directed at hieroglyphs, could have made Champollion wonder whether the same philosophy could be assumed for deciphering Egyptian Hieroglyphics. 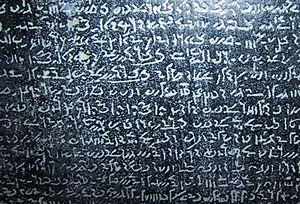 Champollion also realized that among the one thousand four hundred and nineteen signs in hieroglyphs on the Rosetta stone it contained only sixty-six different signs. His experience told him that if the signs were truly and only semantic symbols, there would logically expected to be more than sixty six signs on the Rosetta stone, each one representing a different word as they would have been logograms. It was only through Champollion’s change of mind that we today understand the true nature of hieroglyphics, that the writing system is a mixture of semantic symbols, phonetic signs, phonograms and determinatives. This entry was posted in Language and tagged Coptic, Coptic language, Egypt, Egyptian, Egyptian hieroglyphs, Hermes Trismegistus, Religion, Roman, Rosetta Stone.